I’ve been waiting for this day for several years. 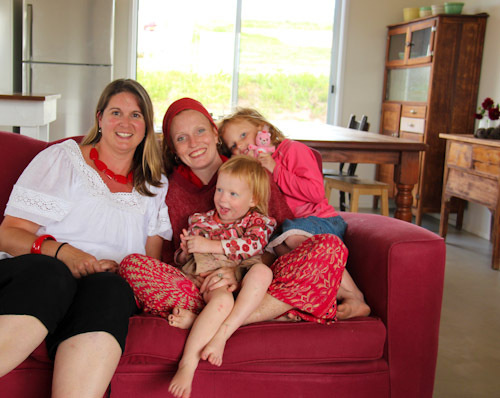 Kim is one of my first Australian online friends, and we share a common interest in blogging, spiritual matters, unschooling and home decor. It’s been a pleasure to correspond with her online, and today we got to meet up! 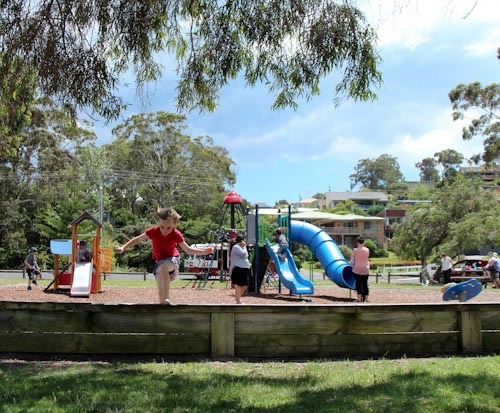 In the morning, we joined Kim and some other homeschooling families in Merimbula for a meet-up at the park. Merimbula is right on the water, and the location is picture-perfect, although the weather conditions today were not calm. Although the wind is icy, the sun keeps us warm as we come together to play and chat. 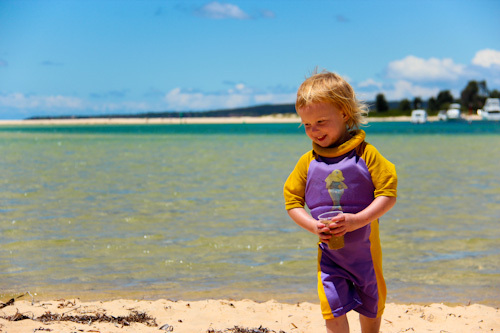 Dell changes into her float suit because she insists she wants to go swimming, but playing on the sand is enough for her on this chilly day. 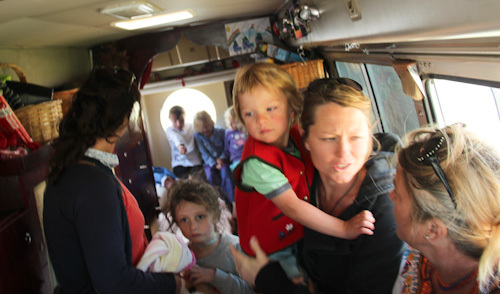 Other mums joined us in the bus (out of the wind) and to speculate about whether their families could live and travel like we do. 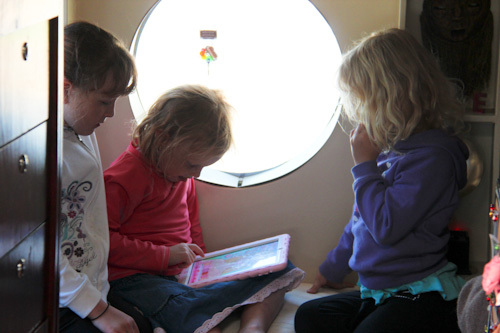 Brioni invites some of her new friends into the bus to she where she sleeps and what she enjoys playing on the kipi. There were many lovely families at the park, and we received several invitations to visit people at home. I wish we had been able to go home with everyone, but those invitations will have to wait. Today we followed Kim and her teenage son Lewis to their new house. 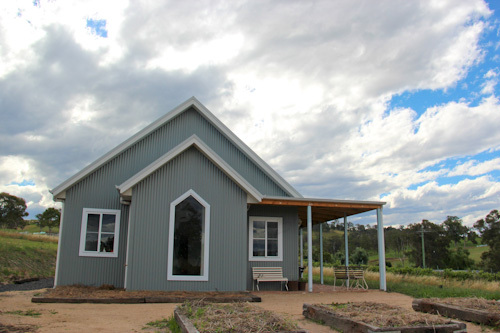 It's a small, two-bedroomed house in the style of an country chapel. Kim has started growing vegies in the raised garden beds out the front. 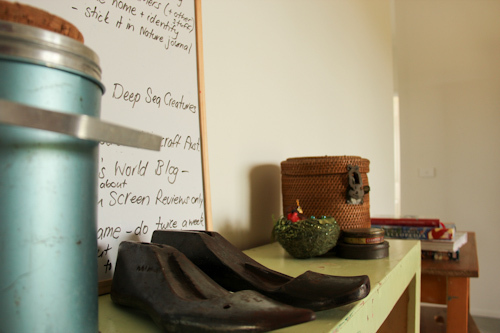 Kim writes online at Feather and Nest about life and home. Earlier this year, she moved into her custom-built house surrounded by grapevines — it used to be part of a vineyard — and she’s been finishing it room-by-room in chic vintage style. 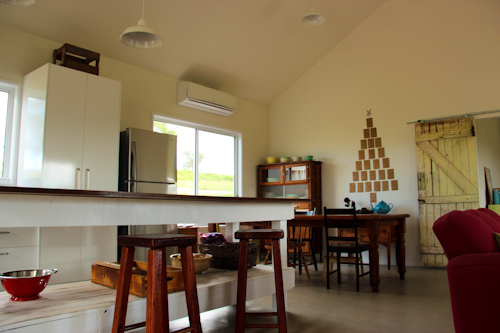 The front of the house is an open-plan kitchen/dining/living/office area. The cathedral ceiling and clean furniture lines add to its spacious feeling. 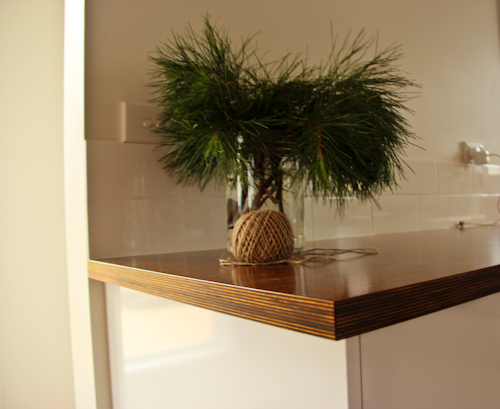 The kitchen benchtops are plywood — stained and lacquered. It's a low-cost alternative that looks great, and I love the striped edges! 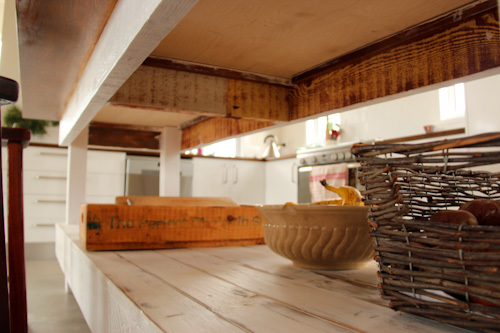 Although the island bench was built from new timber, Kim has finished it in a rustic style. 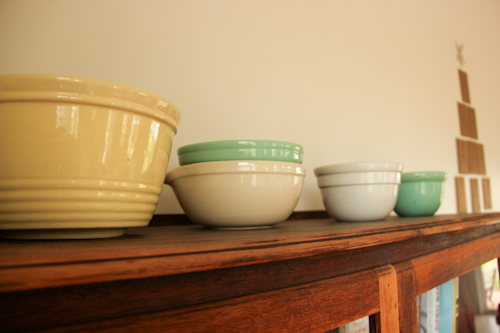 Vintage mixing bowls line up on the top of a vintage bookcase. Kim scours local op shops and markets for items to add to her unique decor. 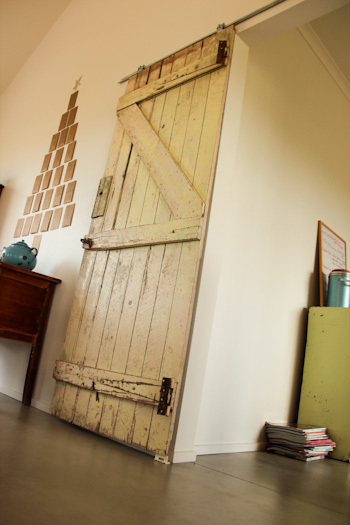 An old barn door slides across the doorway to close off the back of the house. In the background, on the wall, Kim and her son Lewis have created a modern advent calendar with brown envelopes. Kim is reassessing her previous homes' items as she decides whether she wants them in her new, more minimal, nest. The tops of bookcases are the perfect place for a few well-selected treasures. 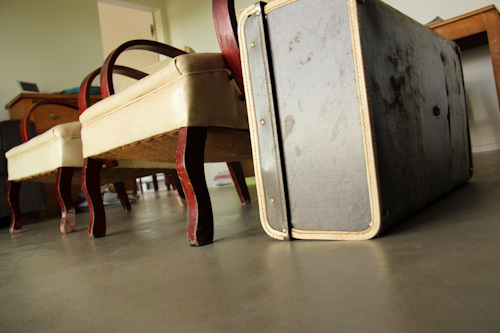 Polished concrete floors add to the house's minimalist style and keep the rooms cool in summer. 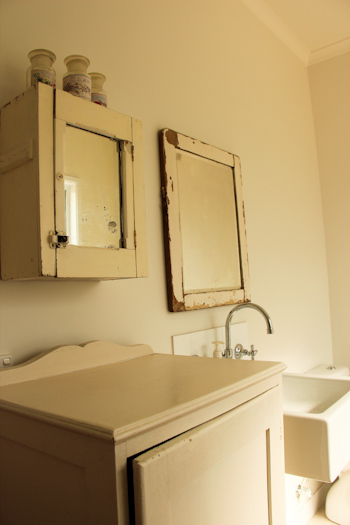 Even the bathroom is furnished with secondhand pieces. Kim has such a good eye for style — her house looks great! The bathroom is designed as a wet room, with just a glass screen protecting the shower. 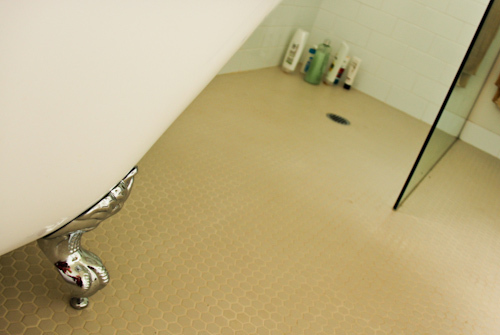 The floor is designed so all the water on the floor flows easily down the drain. 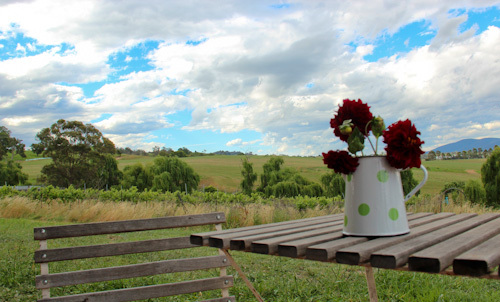 Kim's view is of her grapevines and the countryside beyond them. What will she do with all those grapes? We'll find out next year! 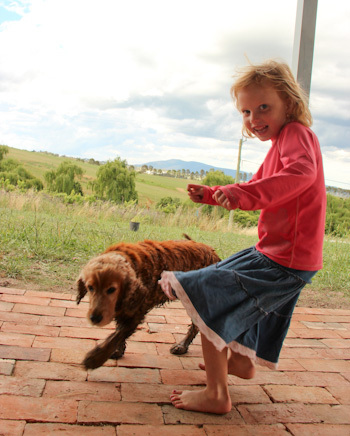 While Kim shows me around the house, Brioni plays with Poppy. Brioni loves to visit homes that have pets, like I did when I was a child. I loved touring Kim’s house, but even more, I loved spending time talking with Kim. There are special friends who enter my life with whom I feel a special affinity, and Kim is one such person. I feel so comfortable with her, as if we are continuing a conversation that we started a long time ago. I am also inspired by her strength and creativity, and I wish we could have had much longer to get to know each other on this trip. After hearing so much about it online, it's lovely to look around Kim's new nest for myself! Thank you so much for the tour, Kim. You have such a lovely home, and I’m glad that you’re embracing a new life and all the changes you’ve been given. You’re a good friend, and we look forward to visiting again in the future! 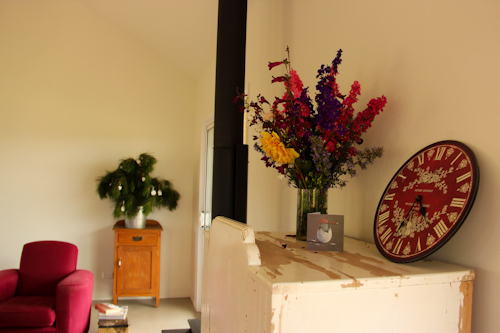 If you would like to see more of Kim’s home — or her beautiful purple house before this one — visit her blog. Definitely liking the style of Kim’s home, and enjoying the home decor tour as you travel around Lauren, the difference between your travelling life and the permanent spaces your friends and family set up are so opposite, I like that you appreciate both!